Will JPC exclude NE from Citizenship Bill? 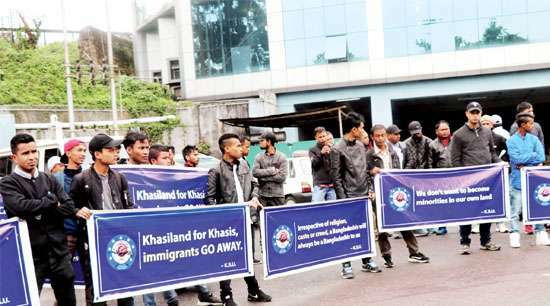 SHILLONG, May 10: The All Jaintia Youth Welfare Organisation (AJYWO) Central Body has expressed its protest against the Citizenship (Amendment) Bill, 2016 of the Union Government terming it as a dangerous Bill towards the Minority Indigenous Citizens of the State of Meghalaya. “We oppose the Citizenship (Amendment) Bill, 2016 of the Union Government that seeks amendment to the existing Citizenship Act 1955 so as to allow the minority illegal migrants – Hindus, Sikhs, Buddhists, Jains, Parsis and Christians – in Bangladesh, Pakistan and Afghanistan to obtain Indian citizenship, as this move of the Union Government would pose a dangerous threat to the very existence of the minority indigenous citizens of the State of Meghalaya,” MH Dkhar, president, AJYWO central body said on Thursday. The AJYWO’s chief also added, “As of now, we have already had enough with the presence of people of unknown credentials in State. The Government of Meghalaya has failed to act till date to verify the legal and illegal migrants living in the State that are now posing a threat to the future of the indigenous tribes – Garos, Khasis and Jaintias of the State”. “We want the State (Meghalaya) and the Union Government to work as a team to verify these people that come like bees in swarms into the State and make our very homeland their paradise. If any illegal migrant is detected, the he/she should be either punished or deported or as the case may be, so that our Indigenous people would continue to survive from generation to generation. But on the contrary, the Union Government is now trying to clear the track for illegal migrants to flow into our land and even make them eligible for Indian citizenship, which is unacceptable to the indigenous people of the State,” he said. “India is already the second most populous country in the world. Just imagine how hard the livelihood and survival of an individual is in a populous and developing country like India. The citizens of the nation are being suggested family planning to control population in the nation, but now the Union Government instead of deporting all those illegal migrants to their own homeland to reduce the burden of a poor country like India is busy in trying to find out ways and means to pave smooth passages for illegal migrants into the country and to provide them Indian citizenship,” Dkhar concluded.